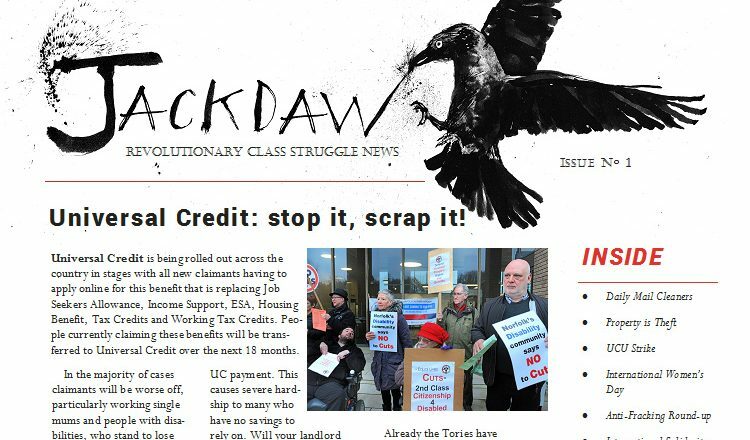 Issue 1 of Jackdaw, the free bulletin of the Anarchist Communist Group out now! 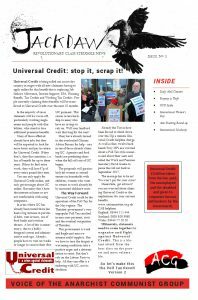 Jackdaw is the paper of the Anarchist Communist Group and is intended as a first point of contact to be handed out on the streets, in workplaces, left in social centres, community centres and shops or to be passed on to people new to anarchist communism. It aims to be mainly, agitational in tone, but with occasional longer, more in-depth articles. Why Jackdaw? Looking for a name that was not the usual, we settled upon Jackdaw because of the characteristics often associated with this bird, characteristics which are an important part of a revolutionary anarchist movement for a new society: resilience and a fighting spirit, as well as being social and co-operative. ‘Jack’ means ‘rogue’ and ‘daw’ means ‘call.’ We are rogues in the current society and our paper aims to call for a working class revolution and the creation of an anarchist communist society. For a PDF version of the first issue, click on the link below.